Sometimes, we take some things for granted. For example, because we keep eating apples (mansanas) or other fruits (prutas), we do not bother to study their parts. Which should not be the case. The more common an item, the more we should know many things about it. In this lesson, I discussed the parts of a prutas. Some prutas have many liso (seed) like the kapayas (papaya) and the milon (watermelon), Some prutas only have one, like the abokado (avocado) and the mangga (mango). The fleshy part of the fruit is called unod (flesh). This is the part which we eat. The hinog (ripe) fruit is eaten, but occasionally the hilaw (unripe) fruit is also eaten, like the green mango or green papaya. Normally unripe fruits are not edible (dili makaon) yet. 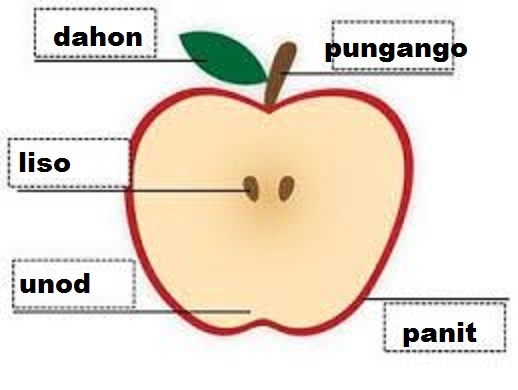 The panit (skin) is the general term for any covering be it tawo (human) or prutas (fruit). So someone with a nice skin is praised with "nindot ug panit." The dahon (leaf) completes the (litrato) photo. A dahon (leaf) can be gamay (small) or dako (big) like a dahon sa saging (banana leaf). And the last, but not the least is the pungango (pedicle). I had to research that one because I got so curious about that extending part of a fruit that is the main connection to a tanum (plant).